This CellML version of the Saucerman and McCulloch 2003 model is a translation of Jeff Saucerman's original MATLAB code. It doesn't run in COR due to the presence of differential algebraic equations (DAEs). Use of additional RDF intial condition hints allow this version to run in the head revision of OpenCell using IDA as the solver. Exporting the CellML to MATLAB using OpenCell and then running the MATLAB output also works. It recreates the results of the original published model. Units require further correction and we are continuting to work on this model. ABSTRACT: The beta-adrenergic signaling pathway regulates cardiac myocyte contractility through a combination of feedforward and feedback mechanisms. We used systems analysis to investigate how the components and topology of this signaling network permit neurohormonal control of excitation-contraction coupling in the rat ventricular myocyte. A kinetic model integrating beta-adrenergic signaling with excitation-contraction coupling was formulated, and each subsystem was validated with independent biochemical and physiological measurements. Model analysis was used to investigate quantitatively the effects of specific molecular perturbations. 3-Fold overexpression of adenylyl cyclase in the model allowed an 85% higher rate of cyclic AMP synthesis than an equivalent overexpression of beta 1-adrenergic receptor, and manipulating the affinity of Gs alpha for adenylyl cyclase was a more potent regulator of cyclic AMP production. The model predicted that less than 40% of adenylyl cyclase molecules may be stimulated under maximal receptor activation, and an experimental protocol is suggested for validating this prediction. The model also predicted that the endogenous heat-stable protein kinase inhibitor may enhance basal cyclic AMP buffering by 68% and increasing the apparent Hill coefficient of protein kinase A activation from 1.0 to 2.0. Finally, phosphorylation of the L-type calcium channel and phospholamban were found sufficient to predict the dominant changes in myocyte contractility, including a 2.6x increase in systolic calcium (inotropy) and a 28% decrease in calcium half-relaxation time (lusitropy). By performing systems analysis, the consequences of molecular perturbations in the beta-adrenergic signaling network may be understood within the context of integrative cellular physiology. 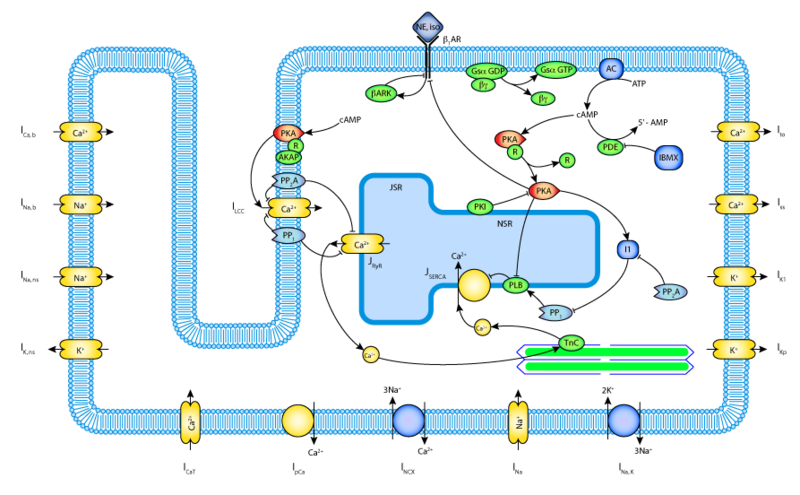 Schematic diagram of the integrated model components, including the beta-adrenergic network, calcium handling, and the electrophysiology of the rat ventricular myocyte. Derived from workspace Saucerman, Brunton, Michailova, Mcculloch, 2003 at changeset 8c159b119986.